Dr Kenneth Johnson receiving his award from Dr Marina Debernardi, Worldwide Director, Global Professional Veterinary Affairs at Hill’s. 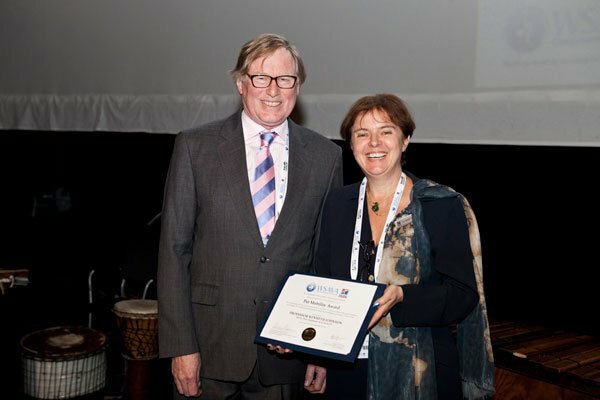 The World Small Animal Veterinary Association (WSAVA), supported by Hill’s Pet Nutrition, announced the winners of two special awards during the opening ceremony of the WSAVA 2014 World Congress in Cape Town. Hill’s is WSAVA’s most long-standing industry partner and supported the world congress as proof of the company’s continued commitment to the veterinary profession. This award was made to Professor Kenneth Johnson, Director of Orthopaedics at the University of Sydney, Australia, in recognition of his work in the field of canine and feline orthopaedic medicine and surgery. This was made to Dr. Gen Kato, Director of the Daktari Animal Hospital in Tokyo, Japan, in recognition of his work to promote companion animal healthcare and the family-pet-veterinary bond. Professor Burrows added: “As we reflect on the success of our 39th World Congress in Cape Town, we would like to extend our grateful thanks to Hill’s Pet Nutrition, our closest industry partner. Thanks to Hill’s’ vision and generous long-term support, we have been able to expand the scope and scale of our work in global veterinary continuing education, nutrition, welfare and other key areas of veterinary care. We have also made great strides in achieving our goal of creating a strong, global veterinary community.